↑ 1.00 1.01 1.02 1.03 1.04 1.05 1.06 1.07 1.08 1.09 1.10 1.11 1.12 "Ricky Steamboat's Profile". Online World of Wrestling. สืบค้นเมื่อ 2008-06-06. 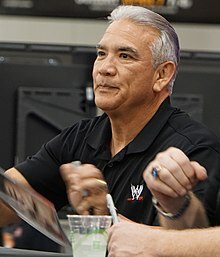 ↑ 2.0 2.1 2.2 2.3 2.4 "Ricky Steamboat's Bio". Accelerator's Wrestling Rollercoaster. สืบค้นเมื่อ 2008-06-06. ↑ Ricky Steamboat: The Life Story of the Dragon. WWE. 2010. ↑ 4.0 4.1 Malnoske, Andrew. "Ricky Steamboat". Professional Wrestling Hall of Fame and Museum. สืบค้นเมื่อ 2011-05-24. ↑ "Ricky Steamboat's second NWA United States Heavyweight Championship reign". ↑ "N.W.A. Mid-Atlantic Heavyweight Title". The Great Hisa's Puroresu Dojo. สืบค้นเมื่อ 2008-06-06. ↑ "N.W.A. Mid-Atlantic Tag Team Title". The Great Hisa's Puroresu Dojo. สืบค้นเมื่อ 2008-06-06. ↑ "N.W.A. Mid-Atlantic Television Title". The Great Hisa's Puroresu Dojo. สืบค้นเมื่อ 2008-06-06. ↑ "WCW World Television Title History". Solie's Title Histories. สืบค้นเมื่อ 2008-06-06. ↑ "WWE United States Championship official title history". WWE. สืบค้นเมื่อ 2008-06-06. ↑ "Ricky Steamboat's first NWA United States Heavyweight Championship reign". ↑ "Ricky Steamboat's third NWA United States Heavyweight Championship reign". ↑ "Ricky Steamboat's fourth WCW United States Heavyweight Championship reign". ↑ "NWA World Heavyweight Title History". CygyWrestling. สืบค้นเมื่อ 2008-06-06. ↑ "N.W.A. World Tag Team Title (Mid-Atlantic/W.C.W.)". The Great Hisa's Puroresu Dojo. สืบค้นเมื่อ 2008-06-06. ↑ "N.W.A. World Tag Team Title". The Great Hisa's Puroresu Dojo. สืบค้นเมื่อ 2008-06-08. ↑ "WCW World Tag Team Title History". Solie's Title Histories. สืบค้นเมื่อ 2008-06-06. ↑ "Pro Wrestling Illustrated Top 500 – PWI Years". Wrestling Information Archive. สืบค้นเมื่อ 2010-09-06. ↑ "Pro Wrestling Illustrated's Top 100 Tag Teams of the PWI Years". Wrestling Information Archive. สืบค้นเมื่อ 2009-03-24. ↑ "WWE Intercontinental Championship official title history". WWE. สืบค้นเมื่อ 2008-06-06. ↑ "Ricky Steamboat's first Intercontinental Championship reign". หน้านี้แก้ไขล่าสุดเมื่อวันที่ 17 พฤศจิกายน 2560 เวลา 02:34 น.